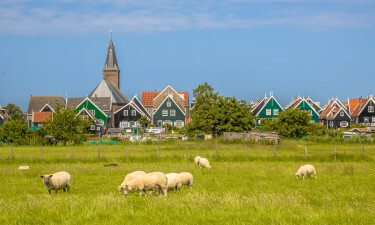 Popular with native Dutch and visiting European campers, Holland offers a variety of coastal and countryside luxury camping sites with many conveniently close to cultural and tourist attractions. If you are planning a camping holiday in the Netherlands and would like to find out more about combining luxury camping with the Dutch countryside or coast, contact LUX-camp for further information. Why should I choose Holland for my camping holiday? Excursions from recreation parks to canal cruises. A wide choice of campsites near beach resorts. Green landscapes in charming countryside. Ideal for families, adults with children and all who appreciate luxury camping at great prices. Covering an area of around 190 by 160 miles, Holland’s largest cities are the capital of Amsterdam and the port of Rotterdam. A choice of permanent luxury mobile home camping accommodation is available at various sites, although please note that private campers or tents are not permitted. The two main areas of interest to campers are the North Sea coast and the Hilvarenbeek region in the south. The Hilvarenbeek area and town of the same name are between Eindhoven and Tilburg, near the border with Belgium. Boasting a number of scenic woodland areas for campers to relax and admire green landscapes, the popular Beekse Bergen park can also be found here. Bordering the North Sea, the Dutch coast boasts numerous campsites - with beaches and seaside towns including Egmond aan Zee. The village of Limmen and tulip fields are nearby. Alternatively, Amstelveen is also popular, on the southern edge of the wonderful Amsterdam forest and close to nature, yet conveniently near the city. Northern Holland province includes the town of Heiloo, near Alkmaar with a cheese-market at Bergen. The whole area has a cultural influence and is popular with painters, writers and architects for those who would like to include explore some of the cultural delights during their camping holiday. With nearly 2,000 kilometres of coastline, there are so many beaches to choose from; many have cycling and walking paths. 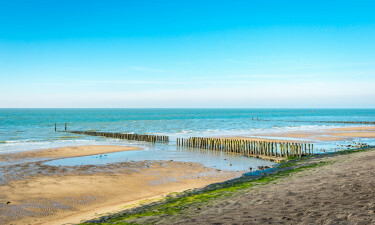 If you like wide beaches with white sand, Callantsoog is worth visiting, while other popular resorts include Katwijk, Bergen aan Zee, and Schoorl. Several beaches offering water sports such as kite boarding or windsurfing. Scheveningen is the most popular beach - long and sandy, with a pier on two levels. Numerous pavilions around this modern seaside resort offer entertainment. Near Heiloo In the north, Klein Varnebroek Recreation Park is popular with anglers, while ramblers can explore a choice of scenic lakeside walking routes. There are children’s play areas, an activity room for toddlers and an indoor heated swimming pool. 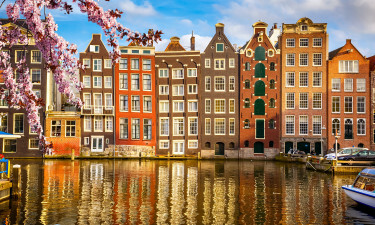 Alternatively, why not visit Amsterdam and enjoy a boat trip? The Rijksmueseum has exhibits from the Middle Ages to the present day, or see the Van Gogh Museum and the beautiful city park. In the south, Beekse Bergen amusement park has an adventure playground and safari park too. Typical Dutch fare includes salted herrings, ‘panenenkooken’ (sweet and savoury pancakes) as well as pea and fresh vegetable soup with smoked bacon. Sate (skewered meat with peanut sauce) and Indonesian noodle dishes are reminders of shipping and the world spice trade, whereas simple stews or meat and potato dishes or ‘stampot’ are popular at colder times. 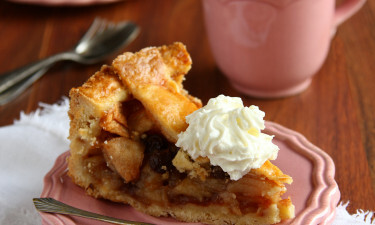 Finally, tiny sweet pancakes and Dutch apple tart are a delight for those with a sweet tooth.